Cameroonians last Saturday 20 May 2017 commemorated with pomp and pageantry the 45th edition of the 1972 Peaceful Revolution. On that day, (20 May 1972) they opted to replace the federal system of Government with the unitary type. That this date has since been celebrated as Cameroon’s national day shows the importance our political elite attach to this event. For, who doubts that 1st January, 11th February, and 1st October are significant dates in the political history of Cameroon? German Kamerun, to the surprise of many, had gracefully moved from French Cameroons and British Southern Cameroons to the Federal Republic of Cameroon, the United Republic of Cameroon, and is today the Republic of Cameroon. What a revolution by people with a craving for peace and unity in spite of diversities! But What about sustaining the principles, sacrifices, political maturity, and above all patriotism that protect and preserve a Pearl direly cherished by peace - loving citizens? The pomp that marked the celebration of this year’s national day despite the uncomfortable scenario that has marked the life in Cameroon since November 2016 shows that despite the crisis within the “family” the majority of Cameroonians do not crave for disintegration of the state. Who doubts that unity is strength and that having righted a colonial wrong, we ought to be proud to preserve the ingredients that truly make Cameroon the “laboratory of African Unity”? When Cameroonians West of the Mungo went to the polls on 11 February 1961 and with a landslide, said “No” to independence through integration with Nigeria, their aim was not to sever an umbilical cord after a union of 57 years. They knew they were out to prove that blood is thicker than water despite diversities and some disillusionment. Consequently, they have to adjust, while pointing out frankly through dialogue, or peaceful reactions what must be done to make every family member feel at home and genuinely accepted, in our reunited peace-loving triangle. While the masterminds of what caused the strikes that have kept teachers out of classrooms, and common law lawyers out of the courts did not call for civil disobedience or destruction of property, we regret that sadists have taken an advantage and want to fish in troubled waters. We do not however, regret this without finding out what gives compatriots the courage to go ahead with what they themselves believe is unpatriotic and unwelcome by fellow citizens and the international community. Hence, we must reflect and act with concern for the future and pride of the past, in respect of the demands of unity and stability. To avert the worst that threatens what we have been struggling to forge; we must be honest to ourselves and demonstrate genuine patriotism, without which it is difficult, if not impossible to progress. We must protect and preserve our unity by identifying what threatens its survival. This is what President Paul Biya has been doing, and has thus calmed many who believed that the complaints about marginalization were falling ending on deaf ears. A common Law lawyer in a chart with friends recently remarked that the Head of state had already done more than what most of them expected. What an acknowledgement! 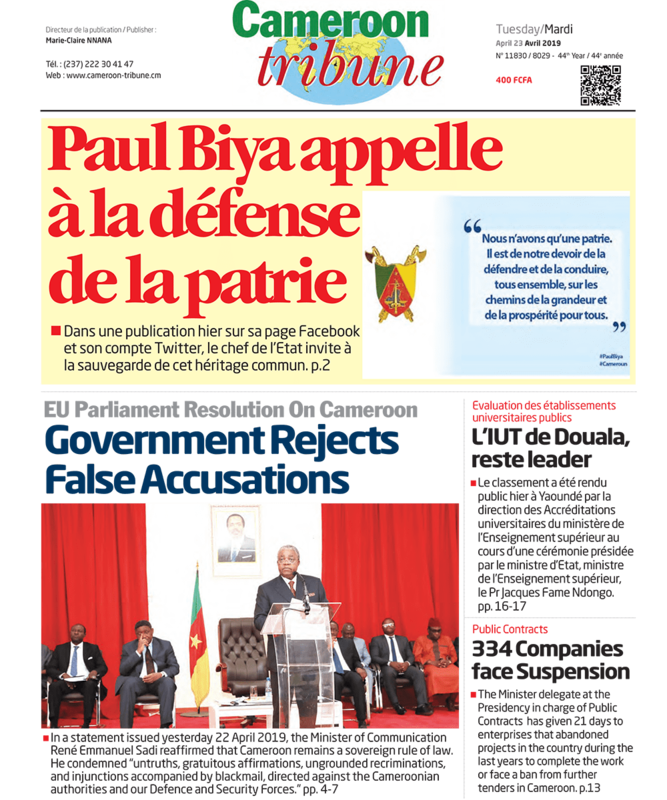 Consequently, it is patriotic for Cameroonians to think of the needs of our children who have been out of school since last November, Common Law lawyers that have been out of our courts since then, and the future of this country. We must protect and preserve the unity that has made us enviable on the African continent, and portray Cameroon’s unity and political maturity. What is precious must be preserved. For, Cameroonians do not doubt that the love, which brought them together since October 1961 has not died out. On the contrary, it made reunification possible, is still with us, and should be nurtured and nourished to consolidate national unity and political stability, direly needed for development. We need this Spirit to give more meaning to the celebration of 20 May as the Country’s National Day.